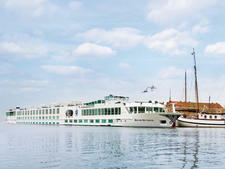 The latest addition to Uniworld's fleet is, in every sense of the word, a floating masterpiece that combines historic artwork and antiques with contemporary, high-tech creature comforts. 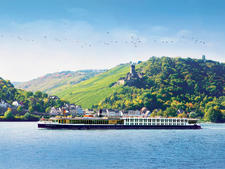 Maria Theresa is Uniworld's third "super ship," sibling to Catherine and Antoinette. 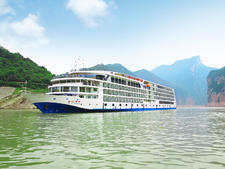 The company promotes itself as a "six-star" line, and although there is no standard industry rating system that covers river vessels, we have no doubt that Uniworld lives up to its self-styled status. 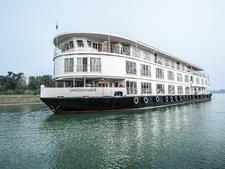 Part of the family-owned group that runs Red Carnation Hotels (Ashford Castle in Ireland is one of their properties), Uniworld offers a refined and boutique cruising experience set against the backdrop of dramatic signature decor that is quite unlike that of any other river cruise line. 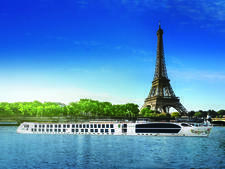 It certainly won't appeal to minimalists looking for clean, unfussy lines, but passengers who enjoy grand, sumptuous surroundings are in for a treat. Maria Theresa's real-life namesake, the Archduchess of Austria and Empress of the Holy Roman Empire, inspired the ship's design. She reigned from 1740 to 1780 as the only female ruler of the Habsburg dynasty (managing to birth 16 children while she was at it!). 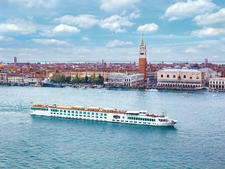 She also reigns over the ship's two-tiered reception area, in an original 10-foot-high painting hung beneath a glittering Venetian Murano glass chandelier. 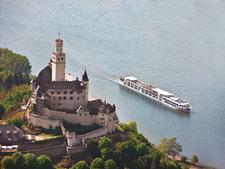 Her Highness would no-doubt approve of this floating palace, decorated in a blend of Baroque and Rococo styles. 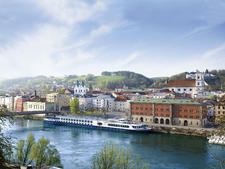 An army of artisan craftsmen was responsible for creating design features in keeping with the empress' era, such as decorative coronets hand-painted with 22-carat gold leaf, silk-clad walls, lavish window treatments, custom furniture and five large murals in the main lounge depicting the 18th-century Austrian countryside. Smaller but equally impressive details include coronets etched into the marble shower floors and tiles in the lobby. Thoroughly modern touches include TVs concealed behind mirrors, heated bathroom floors and climate-controls you can set to the exact degree. There are also keyboards in every cabin to access the Internet via the interactive televisions. 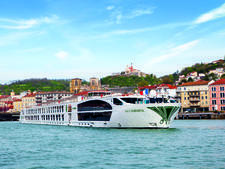 Maria Theresa has just 75 cabins and carries about 40 fewer passengers than river vessels of a similar size, so you can expect a very personal onboard experience. Luxury touches include 11 butler-served suites -- plus attentive service, fine dining and wines that rival top restaurants ashore. The all-inclusive pricing policy covers meals and beverages onboard (a few top-shelf liquor brands excepted), as well as airport transfers, WiFi, gratuities and most excursions. 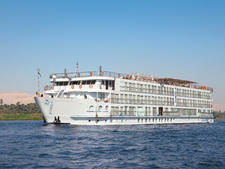 The only potential downside to all this marble-clad luxury is that the ship has a deeper draft than some river cruisers. In a low-water situation, a cruise could be canceled or diverted sooner than might be the case on another ship. However, we think Maria Theresa is so special, it's worth that slight risk. 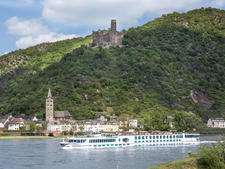 If you're looking for a river cruise experience that's akin to being in a floating palace -- complete with Downton Abbey-style butler service -- Maria Theresa fits the bill. 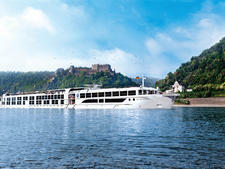 Uniworld caters to English-speaking travelers, and Maria Theresa's passengers are mainly North Americans with a smattering of Brits, Australians and South Africans. 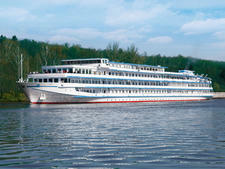 The line tends to appeal to well-traveled cruisers in the 50-plus age range. When we were onboard, the majority of passengers were couples in their 60s and early 70s, with a few younger and a few older. Most were active, and just a handful opted for shore excursion groups targeted to "gentle walkers." 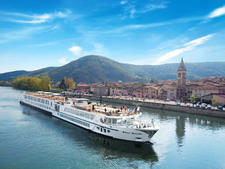 Despite the opulent surroundings, the onboard atmosphere is friendly and relaxed. By day, passengers dress in casual attire, including jeans and shorts. Flat, comfortable shoes and layers are always a good idea for shore excursions -- and consider that many destinations are paved in cobblestones when choosing your footgear. 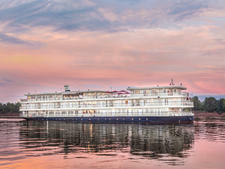 Although there is no formal dress code, passengers tend to dress up more in the evening on these ships than they do on other river cruises -- possibly to reflect the elegance of the surroundings. This is particularly true for the captain's welcome and farewell dinners, with women in cocktail dresses and men in jackets and ties. That said, if you like to push the sartorial boat out and don your formal clothes every evening, you are never going to feel uncomfortable or overdressed on this vessel. Robes, slippers and umbrellas are provided onboard, as are cozy blankets for those who want to be on deck in cooler weather. 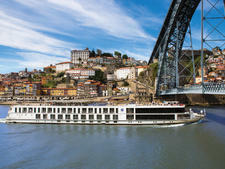 All gratuities, for onboard and onshore services, are included in the fares. The onboard currency is the euro, and the reception desk offers currency exchange.